Andi Tuerk, Safety Manager, practices CPR. First Aid training was provided to Local National employees of the USAG Bavaria – Garmisch Community. 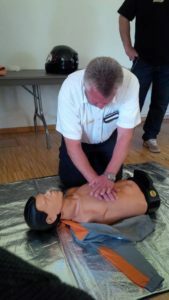 GARMISCH, Germany — The American Red Cross recently administered First Aid training to Local National employees of the USAG Bavaria – Garmisch Community. Classes were provided by the Bavarian Red Cross and held in German. Participants attending the courses work for the garrison, DECA, The Exchange and the NATO School in Oberammergau. Forty-two employees attended this year’s training classes. Each participant will receive a training certificate from the Bavarian Red Cross. The classes are available every two years and training is centrally funded by the IMCOM – Europe Safety Office.